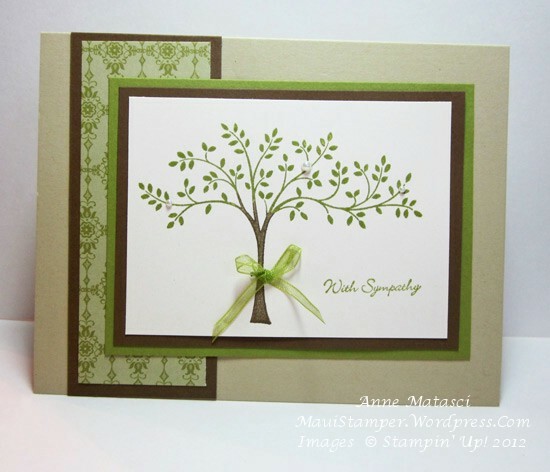 I love using the image of the tree from Thoughts and Prayers for a sympathy card. It’s a full, graceful tree that hints of a life well-lived, of abundance and generosity and beauty. It also seems like a little piece of heaven. Haven’t been there myself, but it seems to me that heaven must have a feeling like being in the woods…and like walking on a white sandy beach…and like climbing tall, majestic mountains…all of those beautiful, powerful places that bring the presence of God alive in a very tangible way. I hope this card conveys that feeling of God’s presence to my friend. I made holes on either side of the tree trunk with the piercing tool and used a big upholstery needle to thread the Organdy Ribbon through. It’s soft and easy to work with, and I much prefer tying my ribbons onto cards instead of attaching them with Glue Dots. Don’t get me wrong – I love those Glue Dots – but I don’t want to take the chance that the ribbon will fall off. I’m picky that way. Could you be so kind as to send me the cutting instructions on your sympathy card.? I love this card! I need to ink up this set again. Thanks for sharing.